Everyone talks about how important it is to build an iPhone or Android app, but it doesn’t look inexpensive or easy. Until now. I’ve been testing appsbar, a free Web-based app that allows small business owners create their own iOS or Android application. I found appsbar.com when researching the digital coupon phenomenon (think Groupon and Living Social) and discovered a post by appsbar founder Scott Hirsch, who built the tool, in part, as a do-it-yourself coupon service. From the merchant point of view, the pricing of coupons is expensive. Most business owners considering coupons could benefit from a tool that lets you build it yourself and keep the profit margins higher. Even if you’re not building a coupon offer, appsbar is impressive. The tool walks you through everything from the icon that will represent your app in the Apple store or Google Android Marketplace, depending on which market you’re targeting, to the functionality on every page. After you pick the basic properties of your app, you go through design (colors, layout, etc.) and then add content. You can add a variety of content on one or more pages just like you would on a website. As you click through the options, you can see in this image below that you have lots of choices for what type of content and functionality you want to put on a page. The choices include events, forms, menu or list of items, video or photo gallery, contact page, a link page, and a promotional coupon page (there are more, but you get the idea). Appsbar reviews all your work and then submits it to the appropriate marketplace for you. I can see the app as it develops in the mockup image on the right side of the screen. 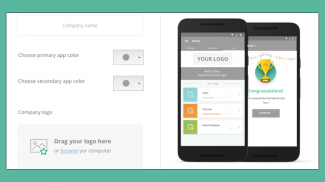 It essentially lets you create a mobile website at the same time you create an app that people can interact with. I didn’t realize that after I created the app and clicked “publish” that the service would review it and submit it to Apple or Google. While it may have told me that once, I just wasn’t ready to commit to that step. It appears to save it anyway, but it left me in a tiny panic that a less-than-ready app might get submitted. Thankfully, the service reviews the app and won’t submit it if it appears incomplete. But a few more warnings or cautions or “heads up” flags would be appreciated. If your app meets all the requirements, you can expect it will be published in 14 to 21 business days according to the followup email you receive when you hit the submit button. With the growing Amazon Android Marketplace, I’m eager to see appsbar expand and submit apps to that major service. If you’ve wanted to create a simple mobile phone or smartphone application, appsbar offers a very easy way to do it at a price point that everyone can afford. Free. Plus, they keep it simple and pain-free. If you’ve had a great experience developing an iPhone or Android application, please let me know in the comments. Thanks for the heads up on this, TJ! 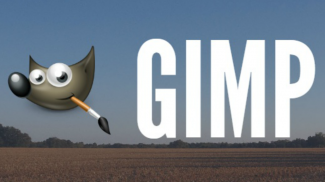 Looks like an excellent tool if it delivers what you’ve outlined — especially if it’s free. Planning to check it out ASAP. This looks great! Will totally check it out. TJ: Great tip. I want to have an app for our tea site in the near future. Have you checked out Red Foundry? Does Appsbar support Adsense, a way to sell ads and make money? This is what i’ve been searching for! I wish Google or Apple or both made it this easy AND free because not everyone who has a great idea for a mobile app is a programmer and or have the funds to develop the app. Thanks for the review TJ! Thanks for the comments and questions. I discovered another app builder via Google — search for “App Inventor” and you should find it. Eric, I’m not sure it supports adsense, but my guess would be that it is either coming to a theater near you soon ;0 or there’s a way to add it. Can an app developed on Appsbar be used on my device without being published?? Would like to use it for my brother-in-law who had a severe stroke. I used appsbar and created 4 different apps. They never published on apple and just ignoring my email. I get email from some guy name of Marc Mannuel who was very nasty to me and then just ignored my emails. They published on Android but with their own branding and name. They never give me credit that i made the app. I then contacted google and they say that appsbar infringes on copywrite and they took my app off by my request. I also contacted google and they said what appsbar is doing is not right and the app needs to be on my own account. Be careful with this site. They say free but it is fraud free! They steal yourstuf. I, too, spent the time to create a quality mobile app only to wait and never have it published. It’s been months and still nothing. They want to sell an upgrade for their creative services – but I already created it. NOTHING. Hi TJ – http://www.appsbar.com here. Thank you for sharing your thoughts on this unique business tool with your readers – we’ve heard from a lot of them already and they are up and publishing apps and getting their businesses attention! We have a number of customer service channels and each app that is published is assigned a personal AppCoach who helps the builder on any issues they may have, whether it’s form or function, or if they are trying to build an app using copyrighted material. Our team is always online at customerservice@appsbar.com and has an excellent track record of helping our users resolve the issues that may get their apps pulled from an app store – working with them before it’s published to make sure it meets app store guidelines so it stays published! 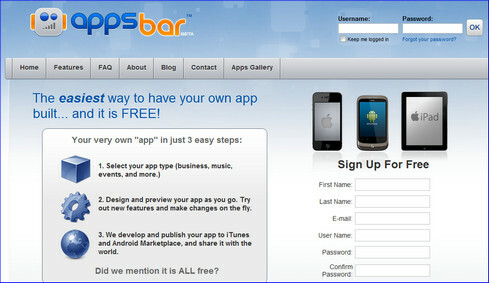 As your article noted, http://www.appsbar.com is free and all of the apps are published to both iTunes and Android Market. 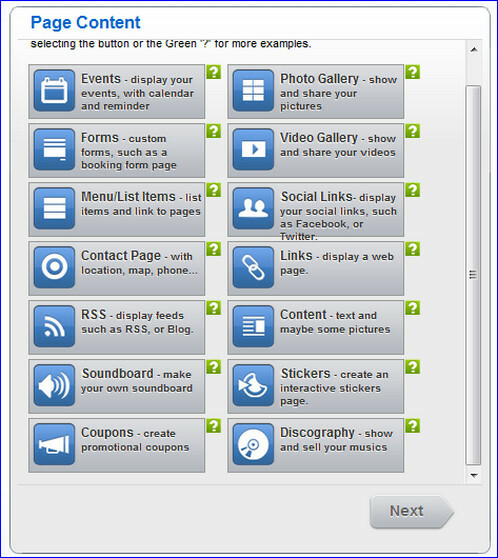 Each app is 100% designed, controlled, named and published by the app builder! We’ve created a unique way for anyone to have access to the tools and channels to publish an app, and each of our more than 50,000 users build their own unique personalities into the apps they publish. If this service is free, how does appsbar create its income??? C’mon, you have to make money SOMEHOW for yourselves and your staff or you would not exist for long. Ads? Sell something else? What? So I submitted a post questioning the usability and integrity of appsbar.com and the moderator chose not to post it publically. It contained facts and logical conclusions based on web searches, not simply my opinion. It’s good to know that you guys are just schills for manufacturers/vendors and that no real information that is not positive about reviewed products and services will ever appear on this site. I’ll find a review site the isn’t afraid of the truth. Hi Bryan, First of all, thank you very much for commenting. Please feel free to submit your comment again. I know it’s a pain, but that’s the only constructive thing I can suggest at this point. Thanks for your comment. As for how they make money, I can’t say for sure as I wasn’t trying to figure that out. Lots of sites test a freemium model as they launch and it looks like AppsBar is doing the same thing. I appreciate your comment. As Anita said, we don’t delete negative comments just because they are negative and there others here. Generally, since I do most of the reviews I won’t include a company if I find out they operate unethically or illegally, of course. AppsBar is free. Loads of other web-based apps are free. Please give me specifics about what they’ve done wrong. Share some good sites with us. I’m presuming you work in the mobile apps space and could share some useful sites with us. Please do. I appreciate the free service that they offer, but here is my situation. My app was published into the Android market over 6 weeks ago. Still waiting on the Apple App Store. After a quick search, I found many who have been waiting 4, 5, even 6 months with no progress. After numerous communication attempts through email and their Facebook page, Appsbar finally admitted to me that Apple is reluctant to publish their apps. They claim that this is because they are publishing these apps for free and therefore bringing no revenue in to Apple. The alternative being, an individual user would have to pay $99 yearly to license and build their own app through Apple development. Whatever the case, Apple obviously isn’t playing nice with these guys. They are either strongly biased against this free service, or they view their App development as cheap and/or leaning toward “junk apps” for lack of a better term. The bottom line is that if you’re like me, you need your app in both markets to fully reach the most users. That’s a no-brainer. That being the case, you should start investigating a different avenue it seems. You actually do get what you pay for. There are many consumer information websites with similar complaints about AppsBar. Appsbar is apparently owned by a well-known email marketing company, and have been accused of farming out user email addresses for this purpose. Perhaps this is the answer to my own question concerning why Apple isn’t playing nice with them. A few questions, that should be easy to answer for any company that wants to be seen as open and organized. 1) Please give us details as to how Appsbar makes money. 2) How can i make money in the app that i will be creating in appsbar? 3) Who retains the copyright﻿ for the app – the Appsbar member creator or Appsbar? Very uncomfortable experience with these APPSBAR “people”. If you are small potatoes kind of business, maybe this service is helpful. If you have serious content (but limited capital)this company is spooky. I believed their claims of coaching, and did not read the complex and unclear agreements/stipulations. There was no process of “coaching”. I have not had a chance to make subsequent changes. When I sent a note to get some satisfaction over my concerns, I received condescending and impersonal rebuttals. The “few days” they mentioned to wait for publication have gone on for three weeks now. I have no idea what is to become of my intellectual property. Subsequent checking up on this company has further spooked me. Have I been taken by a group of “goat thieves”? I created my first app just for fun on appsbar.com which featured youtube video clips and found it very simple and easy to create. They allowed me to post the many videos i wanted onto one of my app page and allowed for me to write the detailed description. After posting links about my app onto facebook and twitter i noticed my downloads increasing. I am allowed to go in and add videos at any point along with other modifications. The only problem that I had was with the Contact page, i did not want to put down my entire contact information but they require that or else the app will not be published. Overall i would say i was happy with this product and now people have my app in their hands.